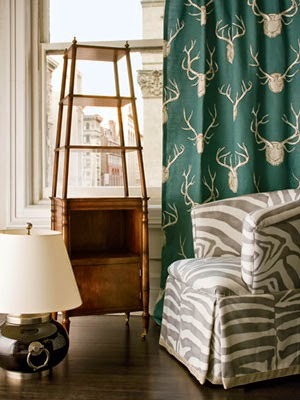 Eric Cohler has created a great looking collection of lodge inspired fabrics for Lee Jofa. It's been around for a number of years now, but I don't think I've ever shown it all together before. Well, it's time to fix that right now! 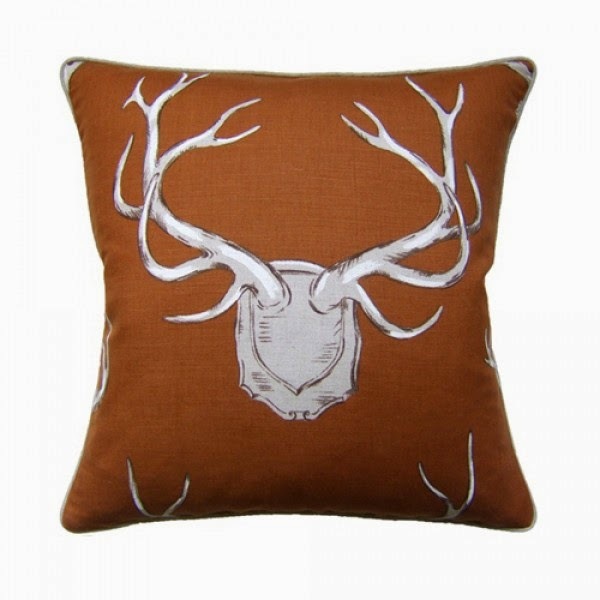 I really enjoy the whimsey of this first fabric, Antlers. 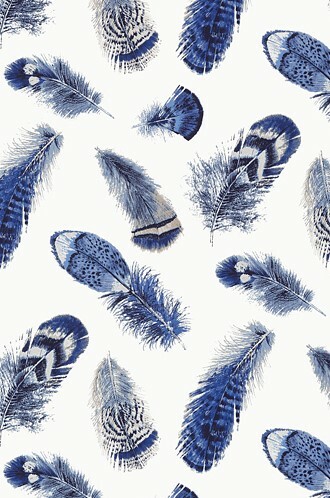 Pierre Frey has been doing similar fabrics for years, see here, but most are now discontinued and they were all much more serious, anyway. This Eric Cohler version is a fresh modern take. If you like a sophisticated paisley, Giovanni Pais is just that, but in really great colorways. By the way, speaking of color, a lot of the collection mixes and matches together. 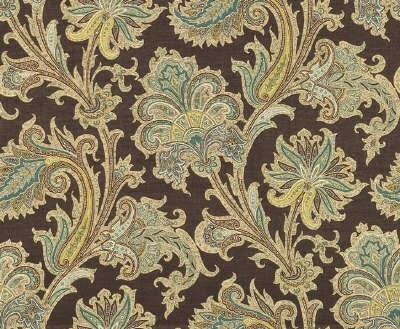 This charmer, Mille Fleur, below, is one of my favorite fabrics in the collection. 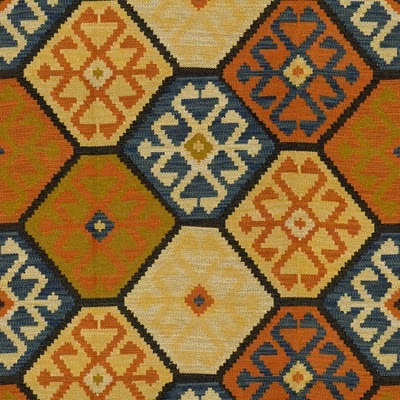 Sundance, a woven tapestry, is absolutely gorgeous in person. 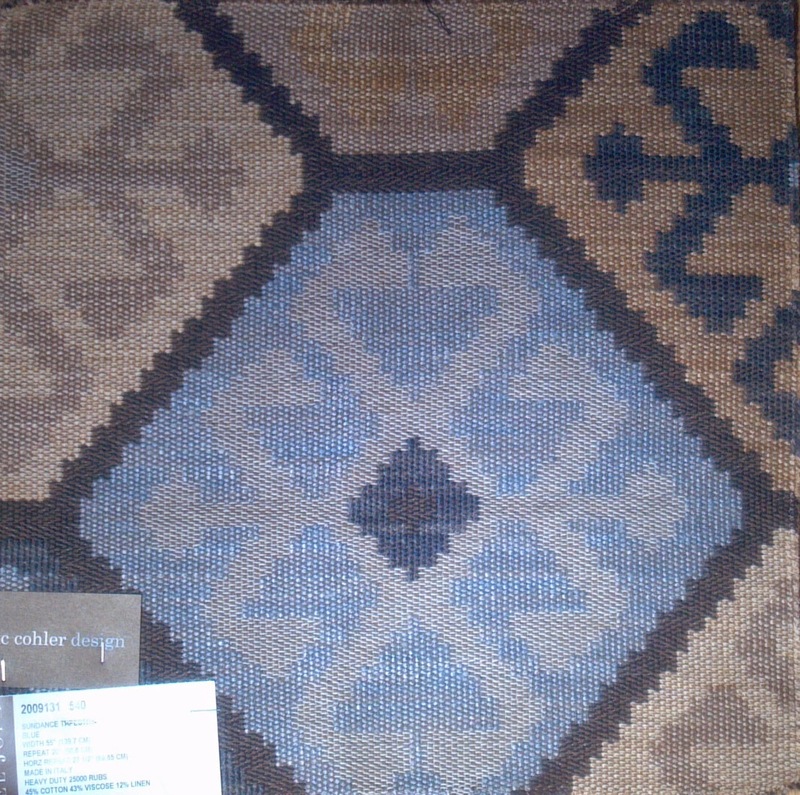 It's expensive though, so it's a fabric to use in small quantities and in places where it can make a big impression. I like it for Euro Shams or headboards in the bedroom. In the living room, it's great for toss pillows or to upholster the top of an ottoman. 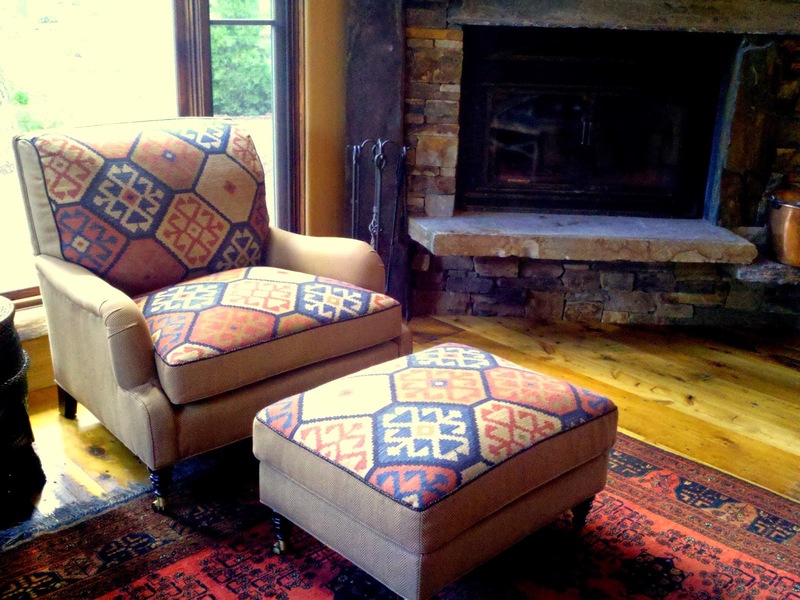 Here's a chair I upholstered in Sundance for a client several years ago. I think we were able to do this for three yards of Sundance (and we upholstered the rest of the chair in a very durable but affordable micro-fiber. 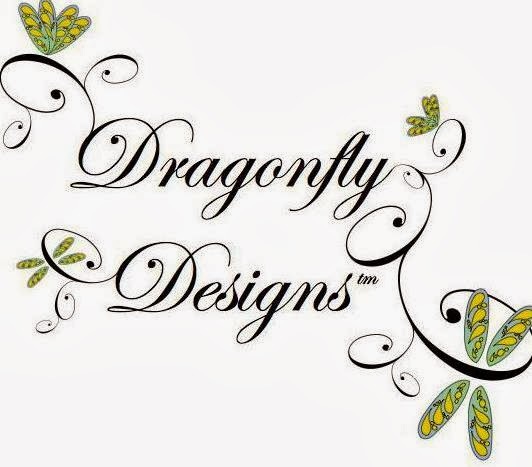 Save a little here, spend a little there...it's all part of my design philosophy.) Perfect for Tahoe, don't you think? Woods, by the way, has a coordinating wallpaper that is also very popular. 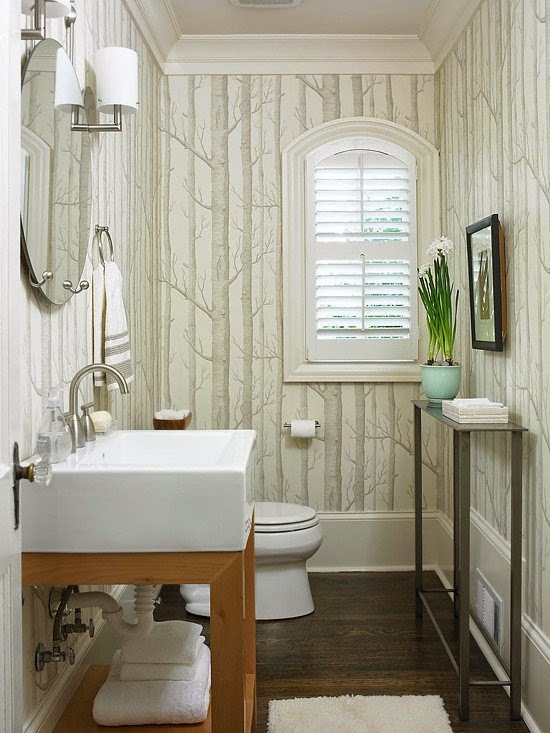 It looks dramatic and fabulous in any room, but I especially like to use it in powder rooms. 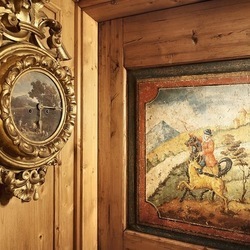 It's also great in offices, entry ways and on the bed wall in any bedroom. But, honestly, like all the fabrics in the collection, you can't go wrong wherever you use Woods. By the way, we're always happy to send samples of anything you see here. 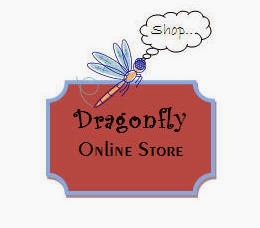 Just email dragonflytahoe@att.net.